Two highly efficient and general one-pot annulation reactions are described for the synthesis of imidazopyridine derivatives (IPs). The two procedures are complementary to each other: Whereas the first one allows the production of simpler IPs, the second leads to IPs with functionalized imidazole moiety. Both methodologies consist of an activation step, which raises the electrophilicity of the N-heterocyclic starting material (i.e., quaternarization of the N-heterocycle), followed by a cascade reaction involving nucleophilic addition, substitution, rearrangement, and oxidation steps. 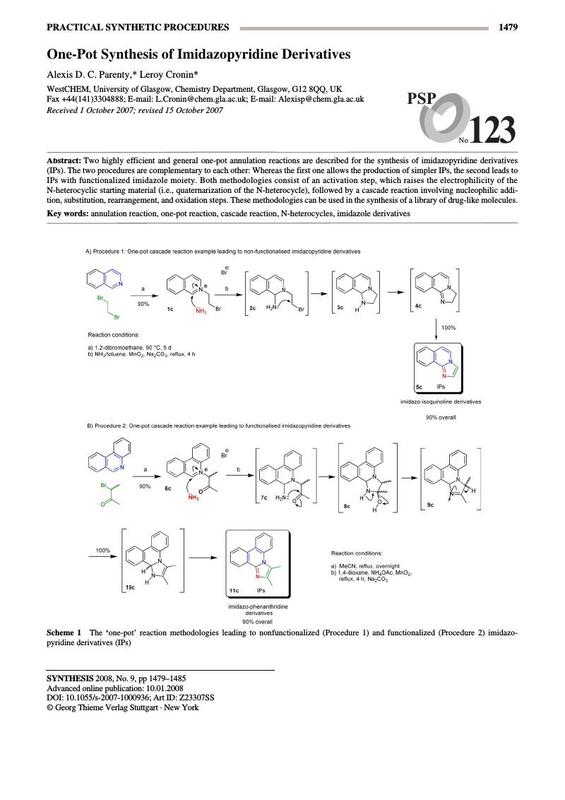 These methodologies can be used in the synthesis of a library of drug-like molecules.